Return to campus for Alumni Encore! Alumni Encore: May 18 is a special day for YJ4L spirit! Return to campus for a morning and afternoon full of free events and programming. Schedule and registration available here; check back soon for more details or watch your inbox. BW Day at Progressive Field: Join BW alumni and friends at a special day at the ballpark, including the BW Men's Chorus singing the national anthem and special pre-game offers. First pitch at 1:10 p.m. Details and discounted tickets here. 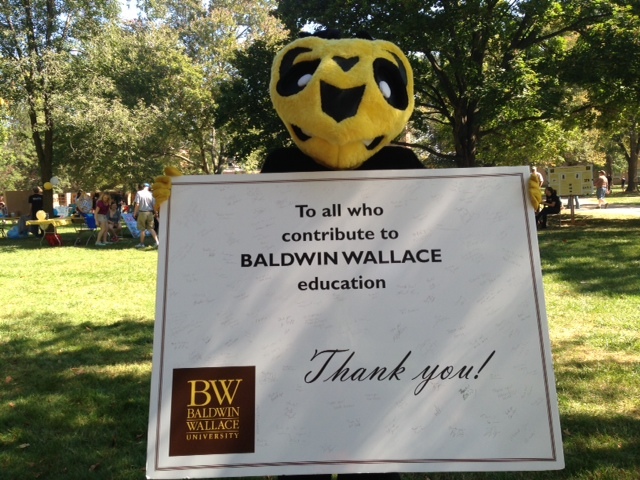 Alumni Perks: This is our way of saying thank you for being an important and ongoing part of the BW community! Visit the Alumni Perks page at www.bw.edu/alumni/perks to browse the options. Class of 1969 Reunion: 50 years of being a YJ4L is reason to celebrate! Reunion details, a class directory, fun throwback features and who's attending list are available to browse here. Send us your updates: If you have moved, changed jobs, or switched email addresses, let us know via the easy Alumni Update Form. Include news in the "What's New?" section of the form and we'll publish in Class Notes Quarterly. Make a Gift: Include BW in your giving plans this year and make a difference in the lives of our students. See details at right about giving opportunities or visit this page. Many designations are available to support what is most important to you. For only $35 per year, alumni in Ohio can support the Annual Fund and sport a BW license plate to show their pride! Details here. For more information, call the Office of Alumni Engagement at 440-826-2104 or email bwalumni@bw.edu. Alumni gather virtually every day on YJ4L (Yellow Jackets for Life) social media channels. Join us on Facebook and Twitter to stay updated on events (on campus and nationwide), hear about alumni achievements, and network with your fellow YJ4Ls. Follow the YJ4L Instagram account (@bwalumni) for images of campus and alumni doing great things. Every Gift Really Does Make A Difference. A little goes a long way at Baldwin Wallace. Make a gift and join thousands of alumni, parents, friends, students, faculty, and staff who support BW each year. All of those gifts add up in a big way. Last year, more than 4,700 alumni and friends made gifts to the University. Collectively those gifts contributed nearly $1.4 million to BW's budget. A true example of the YJ4L spirit! BW's Student Giving Council (SGC) helps embrace the YJ4L spirit early and allows students to pay it forward. This program is all about students helping students and seeing firsthand how the power of philanthropy can change lives. Students give through a variety of events during the academic year, whether it’s $5 or $50, and it all adds up to make a difference. Last year, the SGC raised over $7,800 for the YJ4th Year Gift, a student funded scholarship. Together with a generous match from the Grippin Fund, over $10,000 was distributed to seniors in need. Read more here about the most recent recipients and how the philanthropy of their peers enabled them to graduate. Support what matters most to YOU. You can designate your gift to a variety of annual funds supporting the University and our students, including seven academic scholars funds, the YJ4th Year scholarship described above or area of greatest need. Learn more here.